The MTN Walk the Talk with 702 event caters to walkers of all fitness levels and abilities – there’s a 15km walk which winds through some of Joburg’s iconic landmarks, an 8km walk which goes through the leafy suburbs around Emmerentia, and a 5km walk which attracts a lot of families walking with kids, prams, gran and gramps, and even the family dog. Many walkers use the event as a platform to raise awareness for great causes and come together in vibrant costumes or matching outfits. Others use it for a teambuilder for colleagues and friends. There’s also the opportunity to give back, as a portion of the entry fees go toward communities across the city as part of the Walk the Talk Legacy Project. 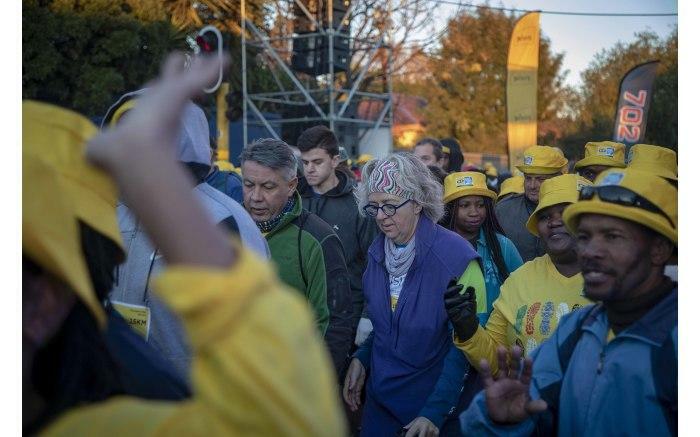 Known to Joburgers as the world’s biggest walking event, with over 50 000 participants, the MTN Walk the Talk with 702 is not only recognised for providing a platform for people wanting to raise awareness about different causes, but also to encourage people to come together and enjoy themselves. In line with 702’s focus on building bridges between people and strengthening communities, the event brings together people from all walks of life, different status groups, of all ages to do something positive and be active. Entries are limited to the first 50 000 or close on 5 June 2019. Each entrant will be given a unique identifying walk number in their Walk Pack to be collected from Number Collection. Persons who enter and pay before 31 May 2019 will receive a personalised walk number. All finishers will receive a commemorative medal on completion of the walk within the specified time limit for the distance. Wheelchair entrants are only permitted on the 5km and 8km due to the nature of the 15km route. Unfortunately, no dogs are permitted on the 15km route. If you’re joining 50 000 walkers in this year's MTN Walk the Talk with 702, you’d be wise to make your travel plans well ahead of time. One of the easiest options for you on the day is to use our Park and Ride service, managed by Park & Ride SA. With departure points around the city, Park & Ride SA takes the hassle out of negotiating road closures around the venue and ensures you can be at the venue with plenty of time ahead of your start. Buses depart from the departure venues below, from 05h00 onwards. The buses will depart every 30 minutes or when each bus is full. You will need to return to the same place where the bus dropped you off once the event is over, in order to complete the return journey. Buses will be colour coded to help you to find the right one for your chosen venue. Log onto your entry to purchase your Park and Ride tickets now! There are 3 distances to choose from at the MTN 702 Walk the Talk with 702, one of which is the 5km which starts at 11h00 and meanders through the suburbs of Emmarentia and Greenside. The walk is generally flat with one hill from the 3km mark but once you hit the 3.5km mark, it’s all downhill from there. The 8km walk starts at 09h00 on Judith Road and walks past the entire length of the Parkview Golf Course on Emmarentia Road. Once you pass the Golf Course, you take a left turn and head uphill through Greenside on Hoylake Road. You have the option of two water points on this walk. For a more challenging experience you can walk the 15km which starts at 07h00 in the morning. It’s always a chilly start being slap bang in the middle of winter, but within the first 3km you will forget about the cold as you amble over the Emmarentia flyover bridge – a unique experience for every walker. The walk then takes a right turn into the University of the Witwatersrand, West Campus and heads up towards the Great Hall on the East Campus, then on past the Wits Theatre into trendy Braamfontein.Another first for most residents of Joburg is walking over the iconic Nelson Mandela Bridge! As you head out of Braamfontein you can enjoy a must-do cultural experience as you walk through the Constitution Hill Precinct, parts of which date back to 1892. From Constitution Hill you walk mostly downhill, phew, through the suburbs of Parktown and Westcliff towards the finish line at Marks Park Sports Club. There are 4 water points along the way but do take a water bottle for extra hydration.